First, the problem, using this article from New Zealand. It is authored by a self-made millionaire to young people. A young property tycoon has hit out at Generation Y claiming they need to stop travelling and spending money on overpriced food if they want to save for their first home. Tim Gurner, 35, is worth nearly half a billion dollars since buying his first investment property at the age of 19. The Melbourne millionaire believes it’s time his generation change their spending and lifestyle habits. “When I was trying to buy my first home, I wasn’t buying smashed avocado for $19 and four coffees at $4 each,” he told Channel Nine’s 60 Minutes program. “We’re at a point now where the expectations of younger people are very, very high. They want to eat out every day, they want travel to Europe every year. Gurner’s comments have been met with a backlash on social media will many criticising how he started out in the property – with a loan from his grandfather. 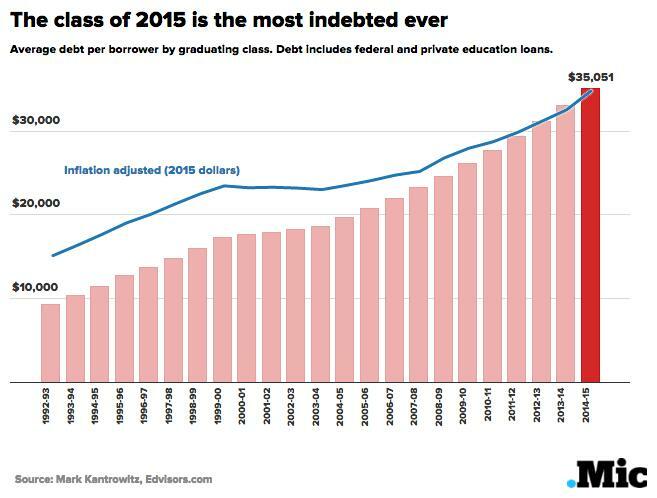 Of course, the average college graduate HAS actually borrowed that much money (see graphic above), but they just preferred to blow it all on alcohol, birth control and a degree in English literature. This woman complained to her boss because she wasn’t making enough money. She graduated with a non-STEM degree (English literature), and lives in one of the most expensive cities in America. (The cities that are all run by leftist Democrats who love to spend money on public works and welfare). She didn’t even have roommates to split the rent! I see this in so many young people – complete disregard for the future in order to have fun, thrills and frivolous travel right now. And all their same-age friends support their decision-making. Young people don’t listen to grown-ups who have experience and real achievements. They listen to their friends. I know one woman who literally flew off to be a missionary in Europe for two years, on the advice of two Christian students, neither of which had ever worked a full-time job or saved money. They were proudly living off their parent’s incomes into their late-20s, and she looked to them for advice on education, career and finances. You don’t have to have a great job to make choices that lead to growing your wealth. Here is an article from Business Insider about how to build wealth on a minimum wage salary. Moving to a more affordable city can cut living expenses considerably. It’s hard to accumulate wealth in Manhattan or San Francisco, but is much more likely in Buffalo or Memphis. Eliminate commuting. Cars are expensive, and it is possible to get a place close enough to work to bike. Cut some wires, particularly cable. After all, it’s 2017 – just go with internet and Netflix. Don’t eat out, unless it’s absolutely necessary. Skip most purchases of new clothes. Instead, make thrift stores your new best friend, and don’t be afraid to mend holes in clothing. Cut expensive activities, and rediscover that the best things in life are free. Playing many sports can be free (or cheap), and public libraries are free (or cheap). Once that’s done – it’s all about investing in yourself. The Obama administration set interest rates low for the last eight years, encouraging people to borrow more and more money – money that they could not pay back. Thankfully, the private sector has ways of encouraging people to save money. This article is from the far-left The Atlantic. Late last summer, Dawn Paquin started keeping her money on a prepaid debit card from Walmart instead of in a traditional checking account. The wages from her factory job—she works from 9 p.m. to 5 a.m., inspecting blades on industrial bread-slicing machines—now go directly onto the Visa-branded card, which she can use like a regular debit card, though unlike most debit cards, it is not linked to a checking or savings account. […]The card is more convenient, Paquin said, and she doesn’t have to worry about monthly statements; she tracks her money, and pays all her bills, with the card’s associated phone app. […]In a 2015 Federal Reserve Board survey, 46 percent of respondents reported that they would have trouble coming up with $400 in an emergency; living paycheck to paycheck is now a commonplace middle-class experience. So while Paquin noticed that her Walmart MoneyCard app asked her from time to time whether she wanted to “stash” some money, she didn’t bother to figure out what that actually meant, let alone respond. […]The program was launched to a limited number of MoneyCard holders in August, offering 500 prizes a month—one for $1,000, the rest $25 each. In December, the company reported that the number of Vault users had grown more than 130 percent, to more than 100,000, and that the average savings had grown from $413 to $572, a 38 percent increase. Paquin actually did end up winning the $1000 prize for stashing some of her earnings. And she saved most of it, of course. Because she learned from the incentives. Thing is in Christian churches influenced by the Word-Faith garbage, there is no barrier to this overspending mentality as the Word-Faith instills the idea that “Christians have a right to be blessed”… Yup, like you can pretend (using the magic wand called “faith”) you live in your own personal paradise, …. rather than deal with living frugally in a FALLEN world. But while the Fall is still in most Evangelical churches statements of faith, it has “fallen” out of the real theology many pastors apply, which is a repercussion of compromise on the issue of origins. Our middle son, as soon as he got a raise that enabled him to buy his own place, did so. He later got a job offer at double the salary, and negotiated to start his own business, as long as there was no conflict of interest. He has a long-term plan. He works hard, has an active social life and is doing well. He is planning his first overseas trip this year – until now he’s been consolidating. I reckon he’s earned it. Our oldest landed a job overseas with a major international company, but property is exorbitantly priced in the city where he is based, so he is renting an apartment almost next door to his workplace, which saves on having to own a car and general transport costs, as he is on a bus-route and near a train station, and he has a bicycle for shorter trips when there is good weather. He doesn’t know whether in the future he will have to move to another base, possibly in another country (he’s already moved countries once), so he has decided not to buy a home. He is earning a good salary in Euros, and is saving and investing, plus doing quite a lot of travelling, with no debt. It’s a matter of what suits one’s circumstances. However, I agree that there is too much materialistic hedonism among many young people, who don’t really plan for the future. It’s also a reminder once again that the welfare state is wrong not primarily because we as a country can’t afford the monetary cost, but because we can’t afford the spiritual cost. Sure, it’s intuitive and sympathetic to take pity on people in difficult situations and throw government money at them, to alleviate their need. But wasn’t it inevitable that such policies would over time create a culture in which people don’t so much bother planning for the future, saving up money to make sure they don’t get in those difficult situations in the first place?